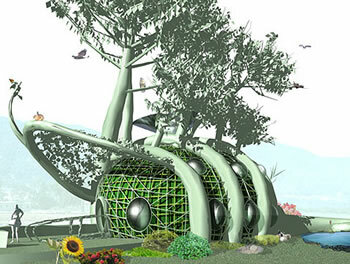 Fab Tree Hab is one of the designs entered in the INDEX world event for design and innovation set to take place every four years in Copenhagen. The designers are Mitchell Joachim, PhD (MIT), Lara Greden, PhD (MIT) and Javier Arbona, SMArchS (MIT). The Fab Tree Hab makes use of a technique long known to gardeners, but not to architects - pleaching. Pleaching is a method of weaving together tree branches to form living archways, lattices, or screens. The trunks of inosculate, or self-grafting, trees, such as Elm, Live Oak, and Dogwood, are the load-bearing structure, and the branches form a continuous lattice frame for the walls and roof. Weaved along the exterior is a dense protective layer of vines, interspersed with soil pockets and growing plants. The designers' intent is to provide a living home. While inhabited, the Fab Tree Hab's gardens and exterior walls will provide nutrients for people and animals. The designers invite us to imagine a society based on the slow growth and care of trees for housing structures, rather than the industrial manufacture of felled timber. Science fiction writer Jack Vance imagined just this sort of society in his 1954 novel The Houses of Iszm. The society cultivated trees for use as houses; trees also produced other useful objects. The dwelling spaces are actually hollow pods supported by branches, and connected by hollow boughs; the Iszic don't live inside tree-trunks. ...[There were] houses with buttressed pods for the high-gravity worlds of Cleo 8 and Martinon's Fort, and loose complex houses with pods like balloons for Fei, where gravity was only half that of Iszm. There were trees comprised of a central columnar trunk and four vast leaves, arching out and over to the ground to form four domed halls illuminated by the pale green transmitted light. He returned to the hotel, and showered in the translucent nodule attached to his pod. The liquid was a cool, fresh-scented sap, issuing from a nozzle disturbingly like a cow's udder. Read more about the Fab Tree Hab at Inhabitat and at Fab Tree Hab at INDEX; thanks to writer and editor Dominic Brown for the story and the quotes.